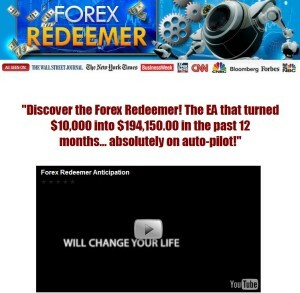 Forex Redeemer is a fully automated Forex EA based around a complicated trading system that works on long and short term trend analysis. The system works on 30 minute and 1 hour time frames and on 4-5 digit brokers. The robot includes an automated money management system but also has an option to use manual management. The system comes with the optimal settings, there’s no need to tweak it to work after the installation. There is no minimal investment requirement as well. While Forex Redeemer works with any major currency pair, the authors recommend to trade it on EURUSD pair. The authors note that even though the robot is fully automated, some basic Forex trading knowledge is required, for that there are comprehensive manuals for installation, tweaking settings if necessary and how to trade with the system.